I'I agree that her fascination with the mundane is what makes this story. However, I don't completely believe these actions are normal or necessarily life-like. It's almost like one huge dysfunctional family spilling their guts. I think it's a little farfetched, but understand her pulling out the characters whose intentions are less than noble. It's interesting to see how everyone reacts to Barry's death and the ways people respond to questions of their own mortality. Some of the characterizations seem a little banal. However, I still have hope for the second half of the book! Right now, I'm just having a hard time returning to it with all the other books I have around! Life-like may be too much of an overstatement, but I do think they are realistic -- just overdone examples of real life to prove a point. I liked the first half better than the second half, I have to say. When I got to the midway point I was thinking hey this is not Harry Potter but I could be on board for this anyway. I kept hoping everyone was going to turn out to have unplumbed depths of non-hatefulness. I'm really enjoying it so far, and I wonder how much of the bad reviews are due to the critics' inability to judge it separately from her previous books. The universe in Casual Vacancy is so small - one town and one city - whereas in HP the entire magical world was up for grabs. 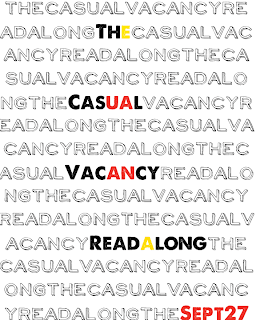 I think Casual Vacancy is (so far) succeeding in what it's setting out to be - a story of regular people with ordinary problems made worse by the hostility in their small town. Looking forward to reading your thoughts on the rest of the book next week! I am one of the readers who actually ended up loving it, for all its darkness and sad moments. In looking back at the reviews, I'm stunned by the harshness of it, and it really is evidence of the fact that some reviewers really were ecstatic to jump into the fray to finally shred Rowling to pieces. But, I found it to be remarkably honest and genuine in its portrayal of hypocrisy, crushing social systems that limit others' ability to help because of excessive rules, and destructive choices that come from well-intentioned people. I'm so happy I read this early on! I can't wait to read what you think of the second half! I could not stop reading and finished the book Tuesday. I ended up powering through the second half as well.